There are essentially 10 things you can do to increase your energy efficiency. These include turning it off, down, taking care of your boiler, being well insulated and employing light saving and draught protection strategies. 8% of your energy bill is constituted by leaving appliances like your DVD player and TV on standby, as opposed to turning them off. You can save energy by unplugging phone chargers and laptop chargers when no one is using them. Also remember to turn switch off your desktop monitor. A 2010 National Audit Office report discovered that an average household can save 30% on its energy bills, or £280 per annum, by switching off electrical products as well as heating when not being used. Turning down your thermostat is an instant and easy way of reducing your energy consumption. It can have a considerable effect on your energy bills, particularly during the colder winter months. Effective control of your heating can lower your annual fuel bills by 17%. Central heating controls enable you to alter the temperature of individual rooms, thus, you can heat the rooms you need to. In the winter remember to turn down your heating onto a low setting should you be going away. Specific timers have a special setting for this to avoid freezing, at a minimal cost. Turning down your thermostat by only a degree centigrade can mean a saving of up to 10% on an annual heating bill. Switching off your radiators when you are at work or when you are not at home also greatly cuts costs. This can mean annual savings of £30. We all need hot water. Yet it does not need to be scalding. Just turning down the hot water cylinder thermostat to 60c can mean an annual saving of £10. You will still have water which is just right for washing and bathing. An average boiler’s lifespan is approximately 15 years. Thereafter it starts to lose efficiency which means you lose both gas and money. When it comes to replacing your boiler make sure that you opt for an “A” rated boiler which shows the Energy Saving Recommended logo. Opting for a heating system which has a condensing boiler and heating controls can make a considerable difference over time. Condensing boilers are considered to the most efficient boilers because they waste the least amount of energy. They convert 90% plus of the fuel used into useful heat in contrast to approximately 60% with the old conventional boilers. Should you have heating controls fitted you can save about 15% on your heating bill. Having a condensing boiler fitted with a full set of heating controls can save you around 45% of your heating fuel bill, around £250 a year. Perhaps the most cost effective way of cutting your home energy consumption is by insulating your home. Loft insulation or cavity wall insulation can lower your bills by £200 every year. Insulation installation can be pricey; however, the costs usually pay for themselves within a few years. Even though insulation can be expensive, it is the most cost-effective way of lowering your energy bills. The Energy Saving Trust emphasised that installation of cavity wall insulation can lower heating costs by 15% and make you annual savings of around £120 on fuel bills. Should you install the recommended 270mm depth of loft insulation, you can save about £155 per annum on your energy bills. Washing half a load of dirty washing amounts to wasting water and electricity, or, hot water and electricity, depending on your washing machine. Washing on a high temperature can also be inefficient, as most washing powders are similarly effective on a lower temperature. Ensure you plug the sink when running hot water as it is another way to make savings on heating costs. Savings differ depending on different machines as well as washing habits. However, the average household can make an annual saving of £11 a year by using an Energy Saving Recommended washing machine economically. You are able to also make saving when drying your clothes. Instead of using a tumble drier, dry your clothes al fresco or on a clothes rack; it will not cost you a penny. 18% of an electricity bill for an average house is made up of fridge, freezer and fridge/freezer use. A further 14% of an electricity bill is made up of washing machine, tumble dryer and dishwasher use, with cooking appliances such as hobs accounting for another 15%. Making sure you choose energy efficient electronics and appliances when buying something new could help reduce your energy use and your energy bills. An energy efficient washing machine uses a third less electricity per wash than a conventional machine. You could save more on your energy bills than the cost of the washing machine over the course of its lifetime. Energy Saving Recommended (products which have the logo, recommended by the Energy Saving Trust) fridges and fridge/freezers utilise 60% less energy than those that are not recommended. This means a savings of about £12 a year for a fridge and £34 per year for a fridge/freezer. Double glazing can halve heat loss through windows. It functions by trapping air between two panes of glass, creating an insulating barrier which cuts heat loss, condensation and noise. Installation of Energy Saving Recommended double glazing can save you approximately £110 per year on energy bills. Getting double glazing fitted professionally is costly and will, therefore, cost you more than most other energy efficient home improvements. It is worthwhile to check whether or not you are eligible for government funding or a grant to assist you with the expense involved in double glazing. You can use energy saving light bulbs instead of standard halogen light bulbs. 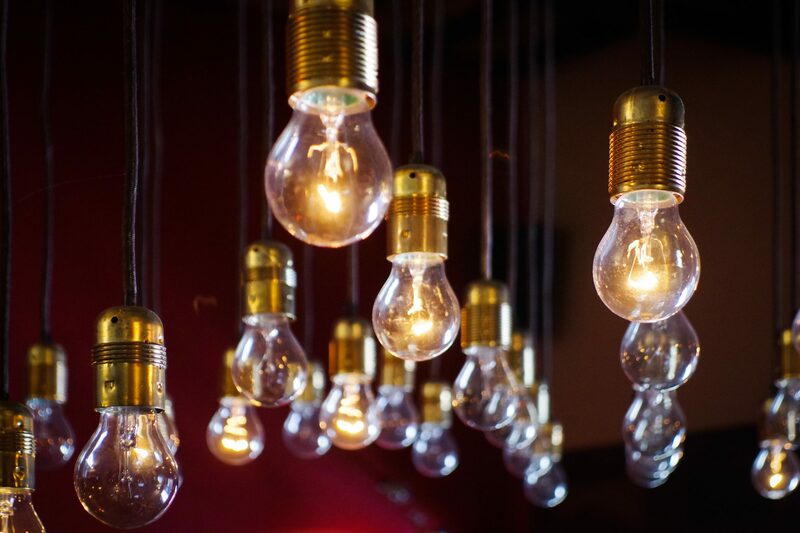 Most of the 600 million light bulbs used in UK homes are inefficient tungsten filament bulbs. You can save money on fuel bills, help to cut national energy consumption and reduce the UK’s carbon footprint by swapping over to energy saving bulbs. It is also important to turn off lights when you leave a room to make further savings. During the day you may wish to open curtains to let in as much as light as possible. At dusk you may wish to draw your curtains closed to prevent heat escaping through windows. A quick and simple way of making savings on your energy bills is by swapping your light bulbs. Energy saving light bulbs cost about £3 each and usually last 12 times longer than ordinary bulbs. You can potentially save an enormous £7 per year per bulb. Your average home has 17 ordinary light bulbs so you can save up to £120 a year by just swapping them over. A typical home loses 20% of its heat due to poor ventilation and draughts. You can fit brush or PVC seals on external doors. These are simple to fix on to your doors and can help eliminate draughts as well as cold spots. Nylon brush seals as well as a spring flap on your letterbox can assist you to eliminate draughts. Newspapers and silicon sealant can be used to fill gaps in floor boards; any gaps in skirting boards need to be filled in with silicon sealant. It will cost you on average approximately £100 to draught proof your whole house. This means you can lower your average household’s annual energy bill by £25, which means improvements will pay for themselves within four years. The Draught Proofing Association can provide you with assistance on what to do in your home with regard to this area and provide advice information on installation as well as any government grants you may be eligible for. The popularity of renewable energy technologies, such as, solar panels, biomass heaters and wind turbines, is growing. These are sound alternatives to fossil fuels and will assist you in meeting your own energy needs, lower your home’s carbon dioxide emissions and reduce your energy bills. Technology has advanced a great deal in recent years, with many homes, businesses and communities becoming aware of the benefits of changing to renewable energy.